I wanted to say thank you for inspiring me to rise and shine with the word of God in my ear. My alarm clock is set to go off at 7:00 am daily to life songs radio, instead of the annoying buzzing sound deink, deink, deink, deink. So when I have gone to wake my sleeping princess, Lacey. I have a godly spirit mood and she doesn’t get eekk, eekk eekk from me. It starts our days off smoother. So thanks again for a wonderful year and look forward to many more. How did me and my kiddos enjoy the ride room from picking up my boy from school? By having a jam session in car with the windows down, volume turned all the way up, listening to Lifesongs!! 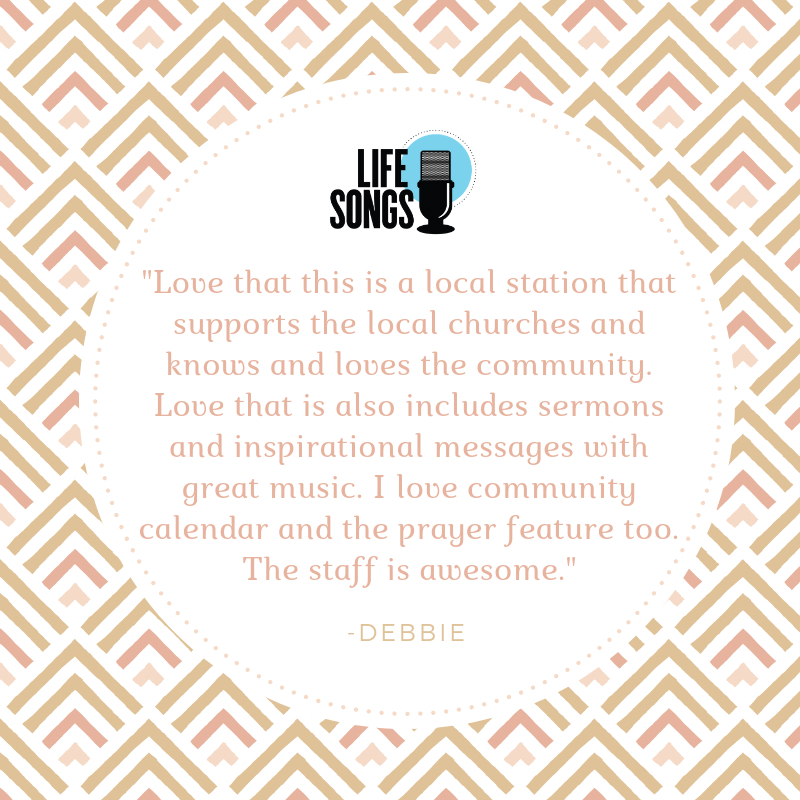 We just love Lifesongs!! God Bless! Hello! 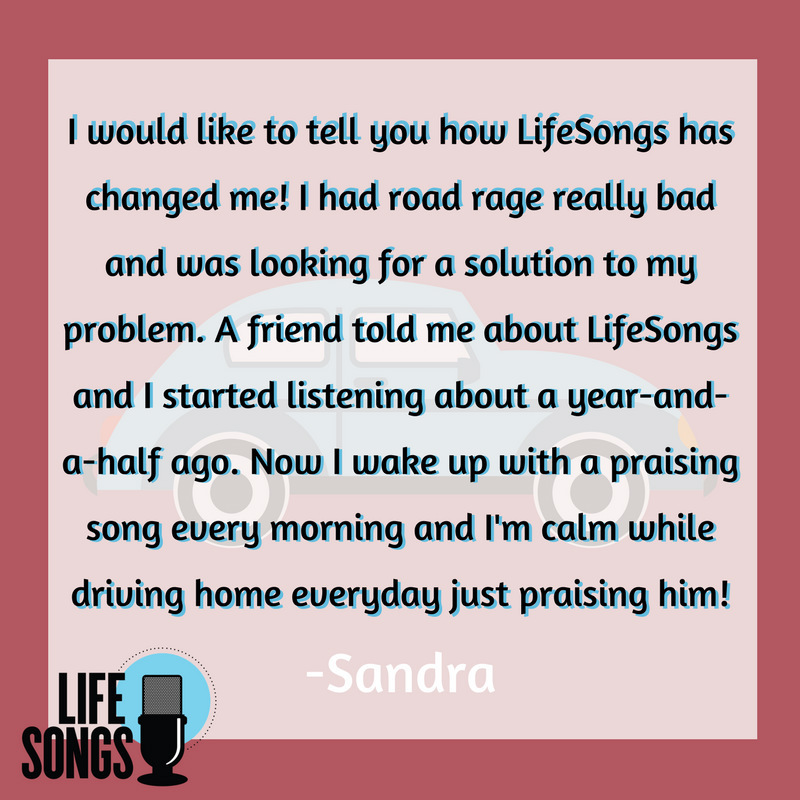 Just sharing a quick praise on how the Lord is using Life Songs here in New Orleans. My husband and I were expecting our first child a few months ago, but lost the baby just a few months into the pregnancy. In that moment of shock of hearing the news that we lost the baby there was only one thing on my heart that made any sense: God IS GOOD. I shared a bit about my story in a blog that I had been writing about the progress of our pregnancy and I titled the entry with the news of our loss “God is good”. As the weeks passed and I was able to gain more clarity on the situation, I was beyond thankful for Life Songs spreading the message that God is good ALL the time. The Lord used y’all in such a special way in my heart on that dark day. He had been speaking that truth to me daily as I listened in. To have that truth be so uncontrollably present when comfort was needed was a blessing straight from Him. God is being glorified through the work that Life Songs is doing, so let’s praise the Lord for that! I just wanted to let you guys know that every time I got in the car today to run an errand every song that I heard spoke to me about not being alone and how God is the strength I need. This past weekend We had a fire at my house and have been displaced for a while. I have four children and am pregnant with number 5. My hubby has been busy working so we haven’t spent much time together this week. The devil has been trying to push that I was alone ever though I knew I wasn’t. Each of these songs I heard had me in tears and spoke to my heart knowing that no matter what I go through….I’m never alone. 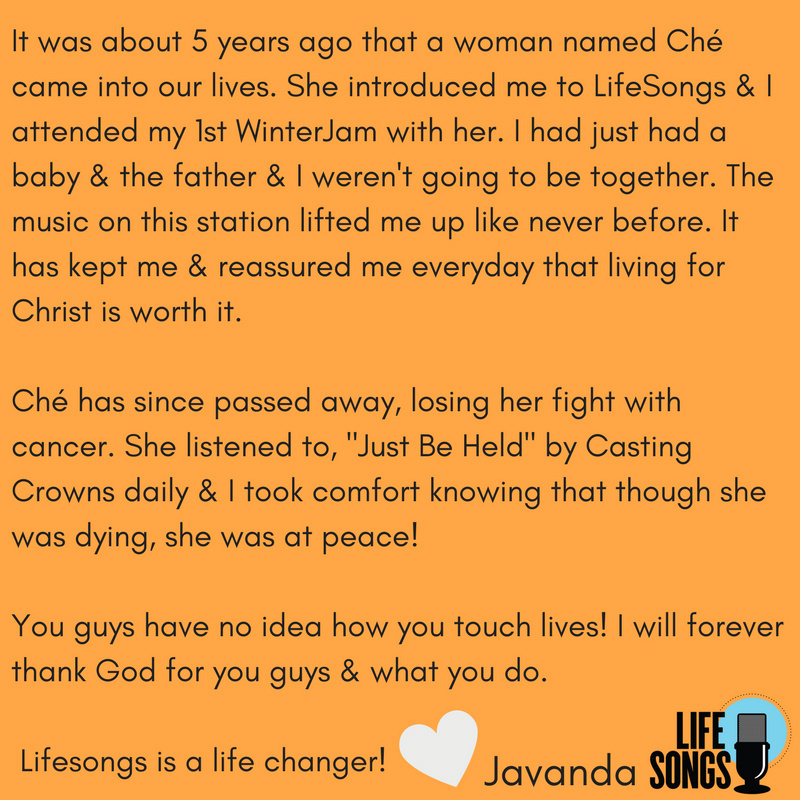 Lifesongs is a very important ministry to so many. I live with bipolar, and sometimes listening to Christian music is the only the thread I have to hold onto my sanity with. 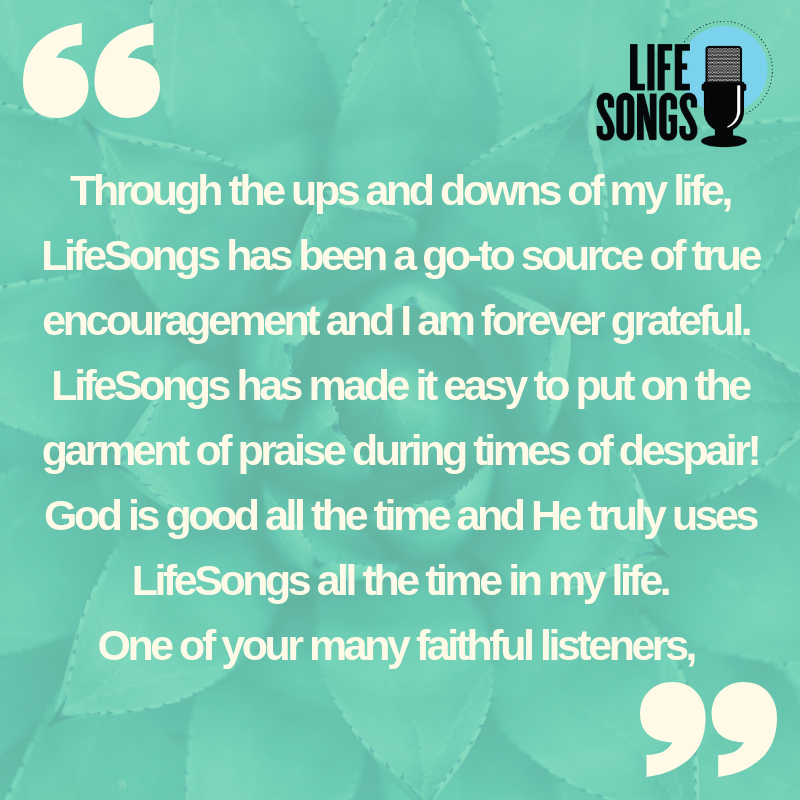 When the world gets overwhelming, being fed by the uplifting messages of the songs of Lifesongs, keeps me centered and makes me feel well … uplifted. It is also wonderful to hear my five year old song sing along with songs that have messages that are shaping the beginning of his walk with the Lord. So on behalf of me and my son, thank you from the bottom of our hearts! Along with God, of course, LifeSongs has transformed my life. It is so uplifting, with positive music all day long. I have been listening for over 2 years now. I love & thank you all! It’s been a difficult year for me but LifeSongs has kept me going! Driving a friend of my children’s home, listening to LifeSongs, and my children start belting out “I am the child of the One True King!” I couldn’t be more proud to have you guys influencing them. 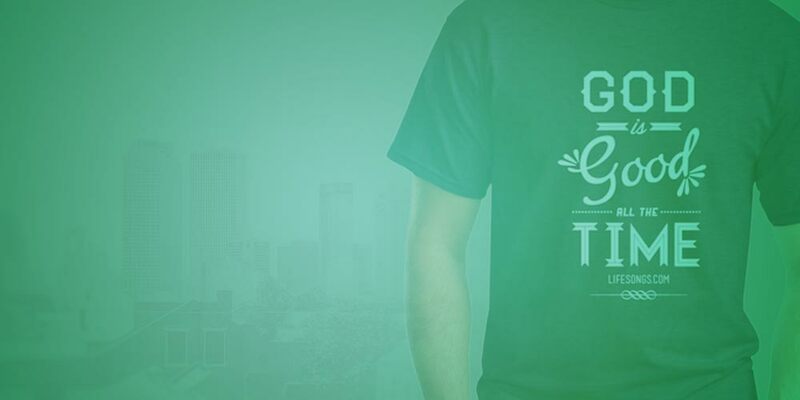 You are changing lives for the better. THANK YOU for all you do. Thank you for bringing such beautiful music in my life. When you weren’t on the air after the hurricanes I felt a void. Julie and Libby lift my spirits every weekday on my ride to and from work. May God bless you all for doing his work so well. I pray that you reach your goal and then some. I donated because I just don’t know how I would get through my days without hearing you! 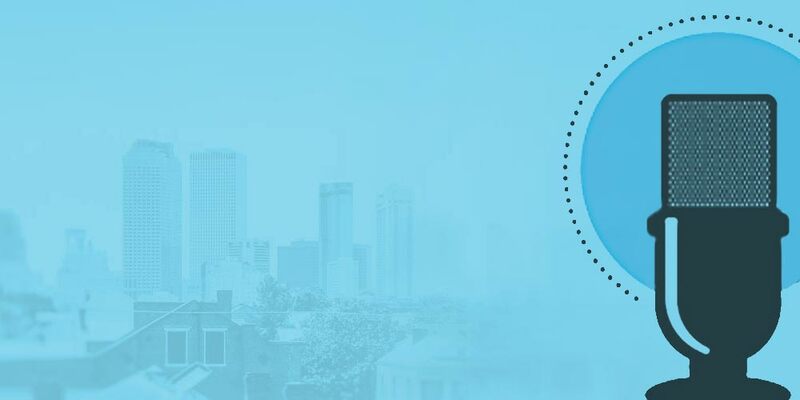 I just wanted to let you know how much the city of New Orleans and surrounding areas are blessed by LifeSongs. 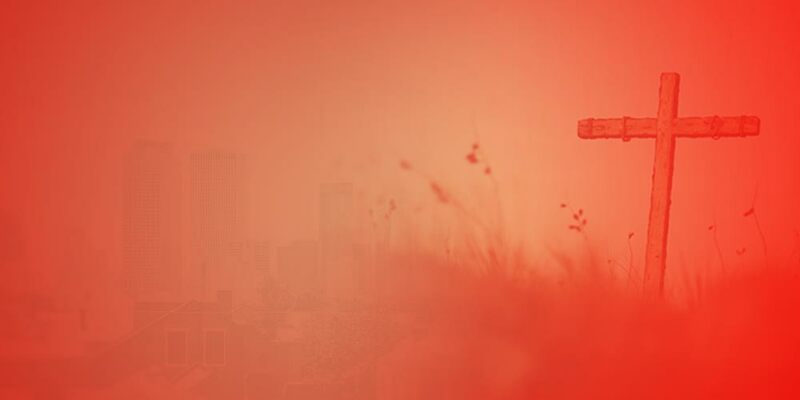 I try to keep you and the station in my thoughts and prayers as much as possible and I never want to take this vital life-giving God-ordained ministry for granted, for it is literally my ‘spiritual oxygen’. Blessings and His grace to you all! Just wanted to let all of you guys know how much I appreciate your positive, uplifting Christian broadcast. I now have the LifeSongs app on my phone. Yes!!!! I listen to you when I walk. I love the tidbits of info that all of you share on the air. Thank You all for your uplifting words, songs and prayer. God Bless you all and through Jesus our Lord and Savior may you continue to broadcast for many many many years to come. God is good all the time! I have been a listener of LifeSongs for several years now. I so appreciate LifeSongs having Christian music to listen to. God really spoke to me while listening as He so often does. God bless all of you at LifeSongs! Love you all. I am so thankful to God that this station exists. If I had not listened to Lifesongs on my way to work last year, and specifically hear Julie’s beautiful voice, I would probably not made have made it through the year mentally,physically, and emotionally. I was and am a believer, but God really was testing my faith and ability to trust him. He was also sanctifying me and calling me to be obedient even in the worse of situations. I had moments when I didn’t think I was going to make it through the week, but God used Lifesongs to get me through those moments and to truly remind me that “God is good all the time.” With Lifesongs, I have prayed my way through that situation, and God has delivered me from that turmoil that seemed it would never end. I now listen to Lifesongs with a happy and joyous heart. I truly am so thankful to be able to be connected to such a great station. I hope God blesses you with many more years. Thanks so much for all you do! My greatest gift was being able to take a carload of teenagers to area concerts (from Mobile to Baton Rouge) and watching God being praised across the generations! 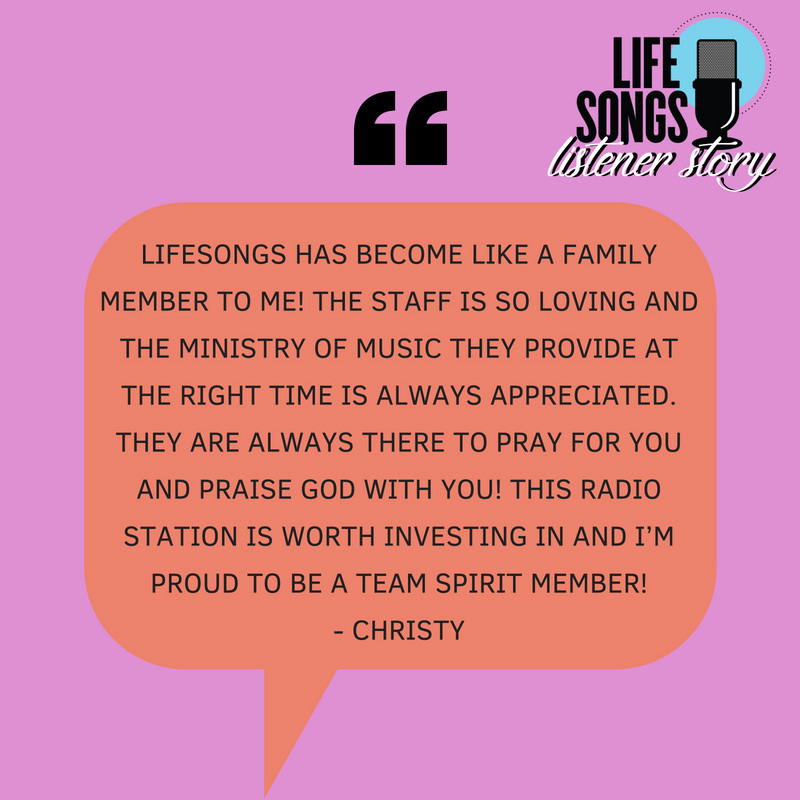 We love our LifeSongs family! Keep doing what you do by bringing His Word to the masses! Thank you Lifesongs for feeding our souls every day! LifeSongs 89.1 fm ministers to me so much. In the 1980’s my husband introduced me to this radio station. It radically put more joy and peace in my life. Thanks LifeSongs! I wanted to send you a note of encouragement. I’m from St. Bernard and always listened to WBSN until my job relocated me after Katrina. I miss being home with my family and friends and church soooo much! When I was in town a few weeks ago I listened to WBSN and heard the announcement regarding listening online. As soon as I came home I set my computer at work to listen all day! I’m so blessed because now I get to feel close to home all day long every day. I know it seems like something so small and silly but it is a connection that means so much to me. You guys are a lifeline to making me feel home again. I just wanted to send you a quick message of thanks. I moved to New Orleans from the northern part of the country in June to begin my adult life after graduating from college in May. I am a teacher in the city and have thus been incredibly busy since I got here. I have spent my Sundays “church shopping” and unfortunately, I haven’t really found a Christian community to call my own yet. Your radio station has been such a blessing to me during this time. I always have it on in the car on my way to and from work and as I drive around trying to get acquainted to my new home. Thank you for consistently filling my life with encouragement through God-loving DJs and music that never fails to center me on Him. God is working through this station to keep me focused on Him in the midst of all the change and craziness in my life. Thanks! Just wanted to let you know that your music has been such a blessing to me. Thanks again for your music which encourages me to set my mind on the things above (where Christ is seated at the right hand of God), not on the things that are on earth (Colossians 3:2). I pray that God will continue to bless your ministry. I want to take the opportunity to thank you for your uplifting, encouraging words each day as well as the ministry through the music and teaching. 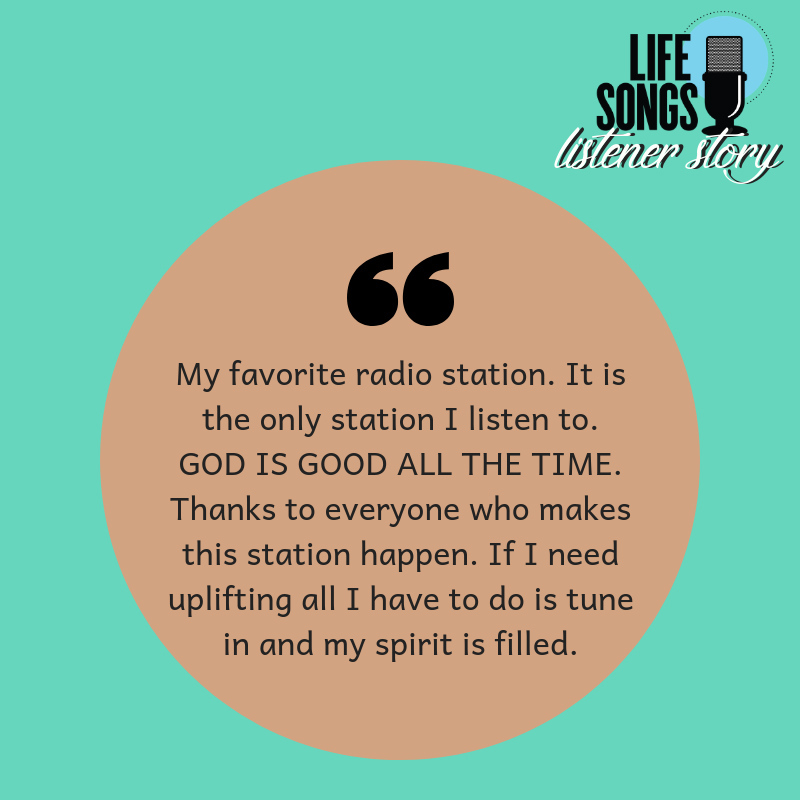 I have been listening to Life Songs for many years and am very thankful for the food for my Christian walk I receive each day when tuning in to LifeSongs. I found your radio on my iPhone apps last weekend, and just wanted to let you know that I listen all the time. I’m listening online, at work, from Sydney Australia and loving your radio station! God bless you for the wonderful work you’re doing! Hi my name is Jarin. I just thought I would email this station to say how much I have so truly blessed by this ministry. I have been living down in New Orleans for over 3 years now, since I moved from Michigan. I originally came down here for hurricane relief work. For most of the time I have been down here I have listened to Life Songs pretty regularly. I listen to it mostly in the car for a few minutes here and there only until recently. I have brought my radio to work and listen to this station for most of the 10 hours I am at work. I have really enjoyed the songs (even if I hear the same songs more than once since I listen to this station all day). I didn’t always like all the sermons by all the pastors though out the day but I have been most encouraged by them the more and more I hear them. It allows me to be fed the Word all day long even if I cannot be in the Bible all day. I have realized as being a pastor myself that it is so important to hear messages myself as well as preach them. All in all I promise you that the ministry of this station has done so much for me and my walk with the Lord. Thank YOU God for this ministry and bless all that are apart of it. God is good all the time! I appreciate LifeSongs so very much and our intercessory prayer group at Gods House Marrero, LA prays for anointing and financial blessings for yall. Love yall! I used to call while driving back and forth to Houma during the times LifeSongs would be asking for partnership to support LifeSongs. I am a supporter and am so thankful for the vision of LifeSongs. Still standing! If you ever paid to hear music on a jukebox prior to knowing Jesus as Lord and Savior then I fully believe you should support Christian radio as a believer. One of the things that drew me back into the world was when I quit listening to Christian radio and started listening to secular music. 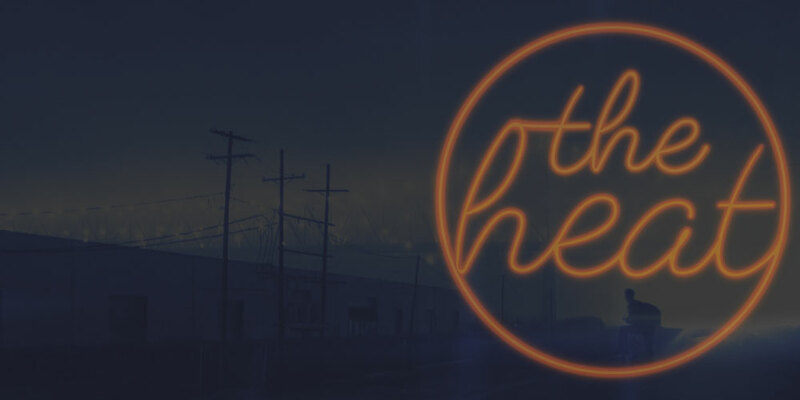 So yes, Christian radio is huge and is an awesome asset to Christians. The spirit man must be fed the word of God and uplifting praise! We, after all, were created to Praise HIM!!! I just want to tell y’all hello and what a wonderful job y’all are doing in the studio. I’m glad I can help with the support, I just wish I could do more. I’m believing that God will help out financially and I already want to give Him the praise for that. This radio station is amazing and has touched mine and my wife’s life tremendously. Thanks be to God. Not long after I moved to New Orleans in 1979 I found y’all on the airwaves. I have listened ever since. Y’all are the first button on my vehicle radio and the only station to which I listen. I recently moved to Havre, Montana. I will miss all of you. Good luck & God Bless!! I have found a Christian radio station in Havre, 95.1 FM, but it is not the same as the family that I had with y’all. Hi. Just thought I’d say Lifesongs is a blessing to my life all day long. I happen to listen online from Kenya and I love the uninterupted music all night long (which happens to be during the day for me). God bless you guys! My name is Carl. I grew up listening to your radio station and God, through you, changed my life. I don’t remember how I found your radio station some 9 years ago but I know Who does. And listening to your programs as a God-loving novice placed a sense of foundation in me that God hasn’t let fall apart. I joined the Army and left for Basic Training in July 2001 and, as you would imagine, I haven’t been home very much since. I could go on and on about where I’ve been. But you know what? I know where you’ve been and it’s been at the heart of me all along. I found your radio station online recently and a sense of nostalgia came over me. My wife and I really enjoyed listening to it and it provoked me to tell you how much we appreciate all that God has done through you. Thank you for your music and messages through God. God is good all the time. God bless and thank you. Hey y’all! What’s up? My name is Brandon and I wanted to tell y’all you guys are really doing a great job and y’all are reaching alot of people down here in Southeast Louisiana! GOD BLESS! Hey there! Im ROSE MARY from Penang, Malaysia. 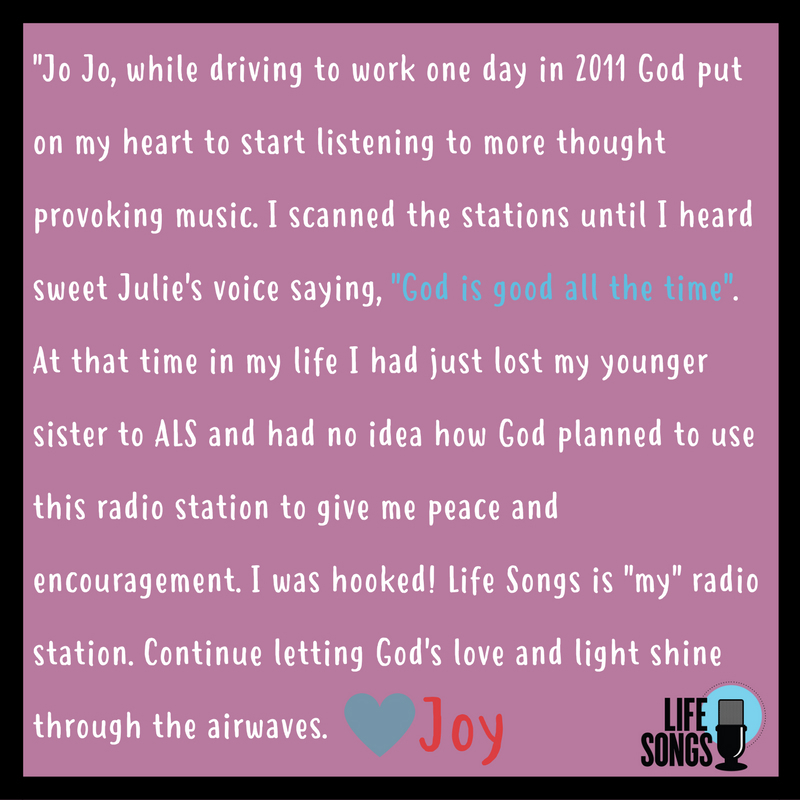 This is my 1st time listening to “Lifesongs Radio”.. I’m listening on the internet… this is one of the best radio stations I ever heard about Christian songs.. The songs played on the radio ease my stress and pressure.. over all it makes me RELAX!!! Want to say hello? Click here to send us your own email of encouragement!